Home » Technical Libirary » Industry knowledge » What are the causes of damage in the construction of Larsen steel sheet pile cofferdam? What are the causes of damage in the construction of Larsen steel sheet pile cofferdam? Larsen steel sheet pile is widely used in infrastructure projects, especially in some deep excavation excavation must use Larsen steel sheet pile cofferdam, but in Larsen steel sheet pile construction, for some reason led to Larsen steel pile Weir is damaged, affecting the construction. Today, we and the road road plate pile of engineers together to introduce the Larsen steel sheet pile cofferdam construction of the reasons for the destruction of what? 1、in the steel sheet pile cofferdam structural design and installation process, the lack of attention to detail. 2、the lack of consideration on the possible changes in the water-resistant steel sheet pile cofferdam and the environment. 3、the steel sheet pile cofferdam excavation process encountered in the new situation, there is no timely check. 4、steel sheet pile cofferdam construction process overtaking. 5、steel sheet pile cofferdam support design or lack of support (quantity and strength). 6、in the steel sheet pile cofferdam design does not consider the role of the load on the support components, such as the role of support in the walkway, materials, pumps and other loads. 7、steel sheet pile cofferdam structural components on the accidental damage is not timely repair. 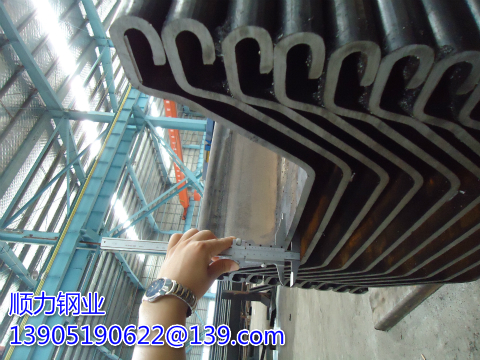 8、steel pile pile soil depth is insufficient, can not prevent piping or uplift, did not consider the pipe or uplift on the impact of earth pressure. 9、steel sheet cofferdam designers and the main structure of the design staff, designers and field management personnel, or management personnel and the lack of adequate communication between the workers. Above 9 points is about Larsen steel sheet pile cofferdam construction of the common reasons for the destruction of the introduction, only to effectively avoid the possibility of these destroyed in order to ensure the smooth construction of Larsen steel sheet pile cofferdam.